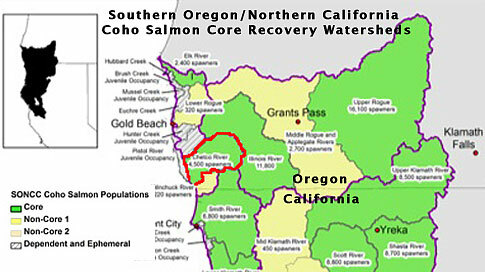 SONCC Coho Salmon include 45 populations from the Elk River in the north, to the Mattole River in the south. These coho salmon were listed under the Endangered Species Act in 1997. Critical habitat was designated in 1999. It includes accessible reaches of river, their tributaries and estuarine areas. The Chetco River coho salmon population is not viable and at high risk of extinction, because the estimated average spawner abundance over the past three years has been less than the depensation threshold. As a functionally independent population, the Chetco River would have once served as a source of spawners for adjacent basins, such as the Winchuck River to the south and Pistol River to the north. As a core population, the Chetco River will be an important source of colonists to other recovering basins in the ESU. Map from NMFS Chetco River profile. Click on map for a larger version. 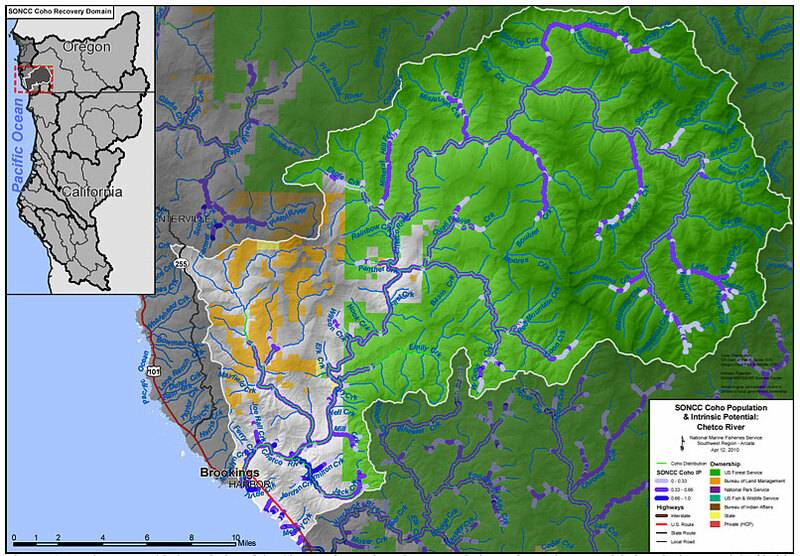 The map shows the geographic boundaries of the Chetco River coho salmon population and the modeled Intrinsic Potential of habitat (Williams et al. 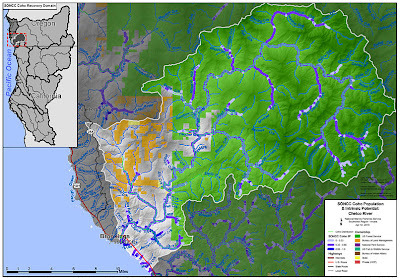 2006), land ownership, coho salmon distribution (ODFW 2010a), and location within the Southern-Oregon/Northern California Coast Coho Salmon ESU and the Interior Rogue diversity stratum (Williams et al. 2006). Grey areas indicate private ownership. The recovery plan includes a population profile for each of the SONCC Coho Salmon populations. The profile for the Chetco River population can be viewed here, for the Smith River here, for the Elk River here and for the Illinois River here. All four rivers are also Congressionally designated National Wild and Scenic River in acknowledgement of their nationally outstanding water quality, wild fisheries, scenery and recreation values. Each of the four watersheds have a high percentage of National Forest and BLM lands—between 75 and 83 percent. The above map of the Chetco River watershed demonstrates this. 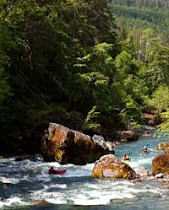 Additionally, over 40 percent of the Chetco River's watershed is within the Kalmiopsis Wilderness. The Kalmiopsis may be one of the few Wilderness Areas in the nation that includes habitat for threatened coho salmon. The high percentage of federal lands is one reason why the Wild and Scenic Rivers of Oregon's Wild Rivers Coast and Kalmiopsis Wildlands are one of the nation's most important salmon refuges. A good place to start to understand the SONCC Coho Salmon recovery plan is the Executive Summary and Key to Understanding. See also Managing whole watersheds for big fish.